There are so many Caribbean islands; you may find it tricky to know which one to choose. When you draw up your dream-vacation shortlist, consider the iconic island of Saint Barthélemy — or St Barts, as it’s fondly known. This gem in the crown of the Caribbean is guaranteed to deliver on the holiday of your dreams. The Caribbean islands are as good as it gets when it comes to a luxury vacation. Your greatest expectations are sure to be exceeded when you cruise the aquamarine seas off Barbados, Antigua, Leeward Islands… plus more, and drop anchor off this pocket of paradise. There are so many Caribbean islands; you may find it tricky to know which one to choose. When you draw up your dream-vacation shortlist, consider the iconic island of Saint Barthélemy — or St Barts, as it’s fondly known. This gem in the crown of the Caribbean is guaranteed to deliver on the holiday of your dreams. Christopher Columbus was the first explorer the island, which boasts a rich and intriguing history, and named it after his brother Bartolomeo. It was also a magnet for pirates. 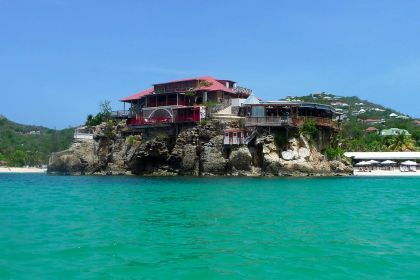 The famous 18th-century French buccaneer Daniel Montbars, known as L’Exterminateur or The Terminator, was rumored to have hidden the treasures he looted from the Spanish merchant ships in the famous Anse du Gouverneur bay. You’ll be hard pressed to find a better reason to go scuba diving in the bay! Of course beyond the remote chance of finding pirate treasure, you are guaranteed to see treasure of another kind: rays, sea turtles and small sharks, as well as ethereal shipwrecks beneath the rich, turquoise surface. 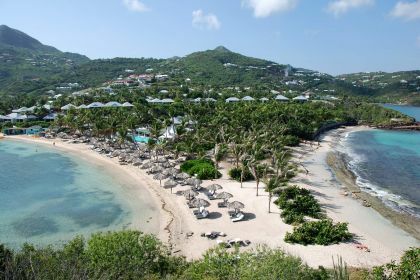 Its white-sand beaches, chic hotels, designer shops and a dizzying array of fine-dining venues define St Barts. Little wonder it is a magnet for well-heeled, celebrity holidaymakers and Hollywood stars. St Barts is considered an overseas collectivity of France, and forms part of the French West Indies, so you can expect a strong French influence in the island — and that includes the cuisine. Take Bonito St Barth, for example, in Gustavia, the island’s capital, with its outstanding food and impeccable service, and exquisite backdrop of breathtaking sunsets. 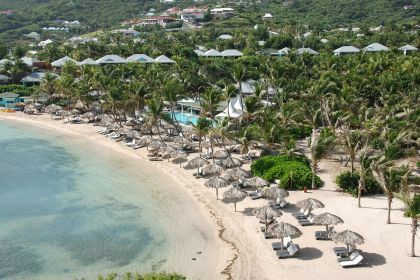 Or how about Nikki Beach St Barth in St Jean, the northern part of the island. When it comes to locations, you’ll find it hard to improve in this. You’re so close to the beach, you can dip your toes in the warm water while waiting for your main course. St Jean is also (conveniently) home to the airport but it’s far enough away not to interfere with your enjoyment of your sumptuous meal. Shopping is also one of the draw cards of St Barts. In the height of summer, the main shopping precinct is a magnet for all manner of celebrities and the rich and famous. It’s not surprising: on Quai de la République, you can shop for many of the top luxury brands, including Bulgari, Louis Vuitton, Cartier and Hermes. If you are in St Jean, explore La Villa Creole for more high-end shopping. The La Savane Commercial Center, across from St Barts’ airport, is also worth visiting. Local artists and designers create charming souvenirs, exquisite accessories and stylish beachwear, each enticing you to take a piece of the Caribbean home with you. Do you want to drop anchor and chill out only in St Barts, or make it part of a thrilling island-hopping adventure? We are here to help with planning, chartering, formalities and in-the-know advice for a perfect yachting escape. Give us a call or use the form here to get in touch with your friendly Abberley charter broker. Whether you are looking for sailing vacation or for a luxury motor yacht we are happy to help.